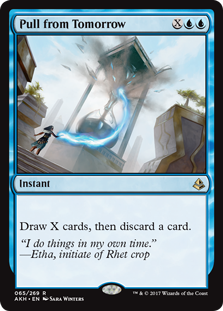 Pull from Tomorrow is the more powerful card, sure; comparable (and maybe even better than) Sphinx’s Revelation. The problem? It’s basically always expensive. So expensive, that in a pressure filled format this ace has been reduced to as few as one copy main deck. Check out “How Many Copies of Pull from Tomorrow?” for more discussion on these cards, plus G/R Energy, Bant Marvel, and more! 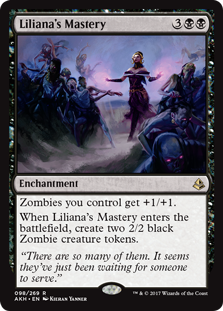 How many copies of Liliana’s Mastery are you supposed to play? You can certainly defend the Mastery as a three-of (“If Gerry did it, it was right.” -Patrick), but there are some pros and cons to this decision. The Zombies archetype would certainly play fewer than twenty-four lands if it didn’t have a five drop at the top of the curve… Does it make sense, ultimately, to cut a copy? First-time Top 8 competitor (and onetime Top 8 Magic Mockvitational winner) Christian Calcano (shout out to @CCalcano) cut another! Christian’s deck was very similar to Gerry’s, just trading one Liliana’s Mastery for an additional fast removal spell. If you think Zombies is the ascendent archetype (it did just win the PT) you may want to play all four copies. To be fair, even two-of Calcano ran the other two Liliana’s Masteries in his sideboard. It’s not just a Crusade, it’s a Grizzly Fate. It’s a giant, spread across multiple bodies. For five mana, you get two 2/2 Zombies… But they are automatically 3/3 by default due to the enchantment itself. It’s cool, especially in a mirror, to make all your Zombies bigger, but that’s not all. Liliana’s Mastery just does the same thing, better. The Gearhulk is 8/8 on the low end whereas the Mastery is “only” 6/6… But the Mastery is across two different bodies. It can also potentially spread even more damage, depending on how many Zombies you already have. Unlike their Theros cousins, Amonkhet Gods start off as creatures. Even if Kefnet the Mindful can’t attack or block, it can, say, crew a Heart of Kiran. While that is pretty good (Thassa is just an enchantment before you have sufficient devotion to blue), it also exposes Kefnet to interaction. Cast Out – Cast Out can handle any type of permanent. Being indestructible doesn’t protect Kefnet from being exiled. Commit // Memory – Bounce-type spells are great against Kefnet. Not that they are so much better against Kefnet than other creatures, but a card like Commit // Memory ignores one of the main features of the card that you are paying for. Oath of Liliana – Perhaps most depressing, the opponent can just lay an Oath of Liliana, killing a Kefnet that is theoretically indestructible, even if it isn’t primed to attack or block yet. 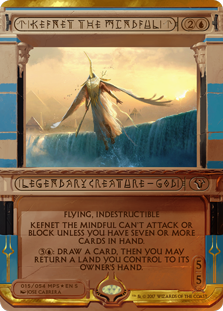 The rules of engagement have changed dramatically with the introduction of Amonkhet to Standard. For example having one mana open means something very different than it did a few months back. You can cycle a Censor… or pay for a Censor. Or (especially in sideboard games) you can cast a Dispel. If you have only four cards in hand at the end of the opponent’s turn, you can attack even if you are tapped out. This is a generally good thing to know, but is particularly awesome if you have six mana and want to be able to cast a three mana Counterspell. Tap four mana to draw a card; if it is a land that comes into play untapped, play it and you will be able to Cancel. If you don’t draw one, though, you can pick up and re-play one of your other lands to get there! 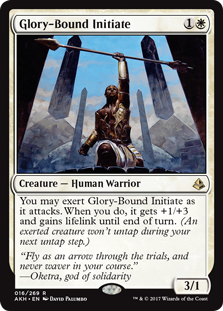 Glory-Bound Initiate is making an immediate impact on Standard. A 3/1 creature for only two mana, even the “vanilla” mode on this card can prove a fast clock. That’s a heck of a fail state! When you actually exert Glory-Bound Initiate, things get interesting. As a 4/4 lifelink creature, Glory-Bound Initiate is a potentially great racer. It is tactically quite layered. The card is well named: You tend to have the initiative with it in play. Will you send a 3/1? How many creatures does he have to hold back if you exert in a 4/4 lifelink? Subtly, this card on two gives you an incentive to build around the exert mechanic. Always Watching is great with any exert creatures. With Glory-Bound Initiate, you get to “build your own Baneslayer Angel” … Even attacking for five on turn three! Glory-Bound Initiate is a 3/1 on turn two. Always Watching makes it 4/2 as a base. When you attack — and exert — the Initiate becomes a 5/5 with vigilance! Since it never actually taps (due to vigilance) there is no liability around Exert and the untap. While Zach’s build only has one exert creature main deck, it is a go-wide strategy that can still benefit from Always Watching. Plus, he has a heck of another exert guy in the sideboard. Glory-Bound Initiate is a human warrior. Played with other humans, this card is really effective with Thalia’s Lieutenant. In addition to white creatures, Zach proved ingenius with his inclusion of red main deck. All the humans — from Expedition Envoy forward — are great with Thalia’s Lieutenant. Hanweir Garrison, though, can trigger it multiple times per turn. Three fours. One three. Perfect. Zach played four Needle Spires in the sideboard; consequently, he could support four Glorybringer and four Gideon, Ally of Zendikar! His sideboard actually allowed Zach to transform into more of a powerhouse midrange deck (from his fast start White Weenie main deck).